ONTARIO TERROIR: MAPLE SYRUP IS TO CENTRAL ONTARIO AS GRAPES ARE TO FRANCE. Our friends, Steve & Janet Roedde, manage a "sugar bush" on St. Joseph Island in central Ontario. 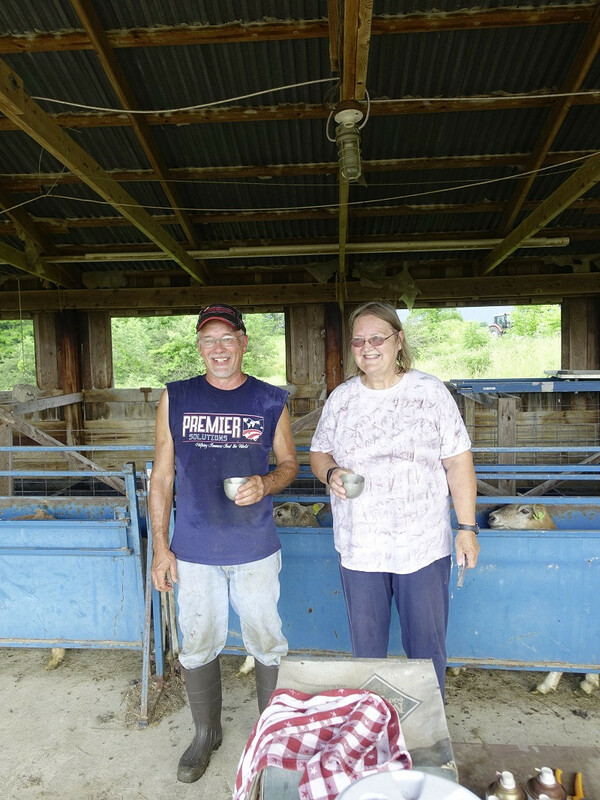 Their business is complex, sophisticated, and sustainable, harvesting one of nature's sweetest and greatest offerings. In contrast to large-scale commercial operations, theirs is powered entirely by wood and solar energy. Extensive networks of blue tubing snake through the forest at waist height, transporting sap from tree to larger underground pipes and then to the processing barn, under pressure from vacuum pumps. Sap enters the barn at 2% sugar content, is subjected to "reverse osmosis to bring it to about 8%, and is then brought to a wood-fired boil. Once syrup reaches 67% sugar, it is filtered and bottled. A 40:1 ratio exits between sap and syrup, and each tree offers about 15 gallons of sap per year. It is not uncommon for 100-year-old trees to continue to give sap at this rate. SUMMER SOLSTICE: THE TIMELESS SERPENT OF THIS MOUND HONORS THE SUMMER SOLSTICE. The alignment of the head of Serpent Mound, in Adams County, points to the setting sun on June 21. Beautifully undulating coils of the serpent's body align with the winter solstice, the spring equinox, and the fall equinox. This fascinating earthen structure was built around 300 BC, by sophisticated native Americans, upon land thrust upwards by the strike of a meteorite, rendering it dense with astronomic power. 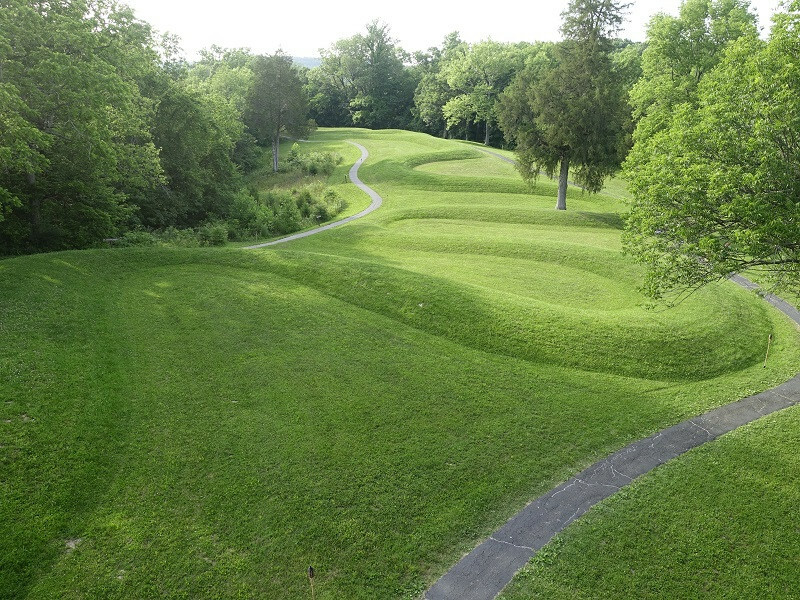 Serpent Mound is over 1,300 feet long and three feet tall, and is the largest serpent-effigy in the world. It is a powerful site, full of concept, dignity, and magic, on par with the cathedrals of Europe and the pyramids of Egypt. HUMAN TREASURY: WE ARE ONLY AS GOOD AS THE PEOPLE WITH WHOM WE WORK AND LIVE. Cole Hidy and Kathy Kipp bring strength and depth to our team. Kathy has served many roles for us over recent years, primarily as a good neighbor. She has also performed extensive work with Jacob Bartley in our wetlands, being quite a naturalist herself. This past winter, she provided invaluable assistance feeding animals and chasing down water-leaks. She is also handy with equipment and mechanical problems. There is not much she can't do. INSPECTOR 1317: INSPECTOR 1317 HAS BEEN ASSESSING OUR FARM. 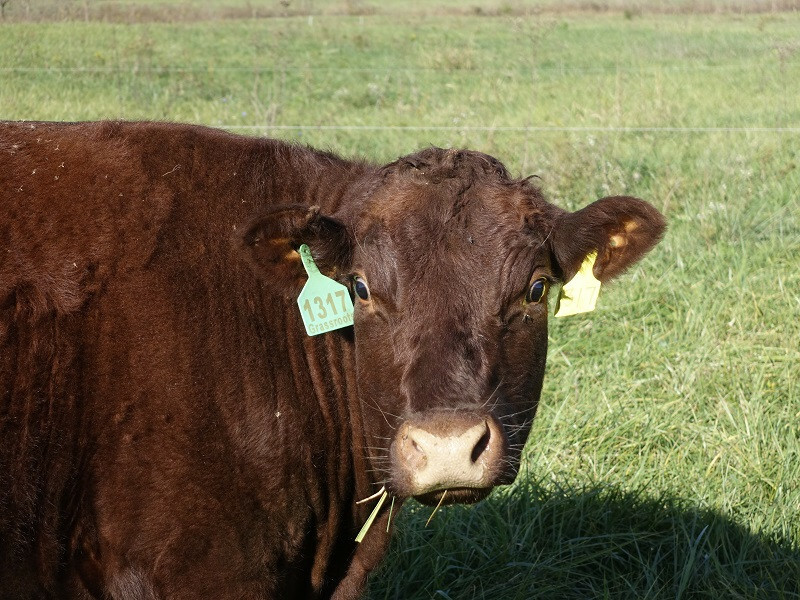 She has been in residence for a number of years to determine whether we meet "certifiable" protocols for management of land, animals, and food. She is a demanding negotiator with exacting standards, so much so that she has nearly turned us Libertarian! It is tempting to exclaim, "Enough with all these regulations! Let customers do their own inspections." But she has convinced us that meeting painstaking standards is good for business. LAMB TREASURY: LAMBING HAS BEEN COMPLETED, AND WE BEGIN TO TAKE STOCK. We moved the ewe-flock today out of their nursery field, where they have resided for the past six weeks. That area is a large 30-acre field in which ewes are free to roam, give birth, and bond with newborns, without interference. We disturb them as little as possible during that time. We used to worry about every newborn finding its mother and made extensive efforts to provide surrogate parenting. But over the years, we began to suspect we were doing more harm than good. We now practice laissez-faire management at lambing, which is a lot less stressful on all parties. TURKEY TAIL: BEHOLD THIS BEAUTIFUL TAIL OF A "TOM" TURKEY. 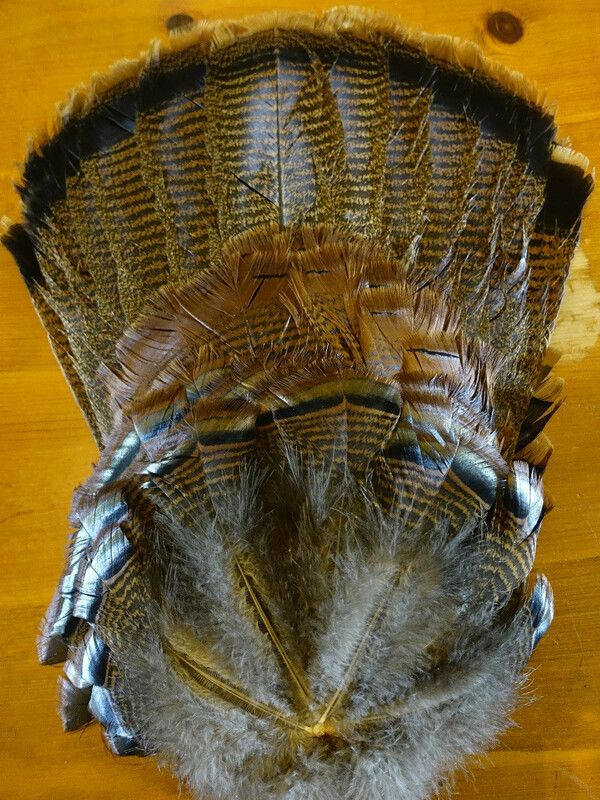 Most of the month of May is turkey-hunting season in southern Ohio, and this shimmering, elegant tail was recently offered to me by neighbor, Kathy. Several weeks ago, she enticed a "tom" to present itself closely enough in the woods, to feed her family on Memorial Day. The colors of the tail are breathtaking in their muted, silken flow of browns, reds, and yellows, which most of us don't witness up-close. Some of nature's greatest artistry seems to be expressed in the plumage of birds. RUN FOR ROSES: JUST SOUTH OF THE OHIO RIVER, DERBY DAY COMMANDS HIGH ATTENTION. In anticipation of the most exciting two minutes in sports, those with blood of Kentucky in their veins faithfully prepare, so their counterparts may Run for the Roses. The stories, pageantry, excitement, and equine beauty of the Kentucky Derby is unsurpassed, always making for memorable impression. Susan rises to the occasion each year, to celebrate her home state and its many glories. 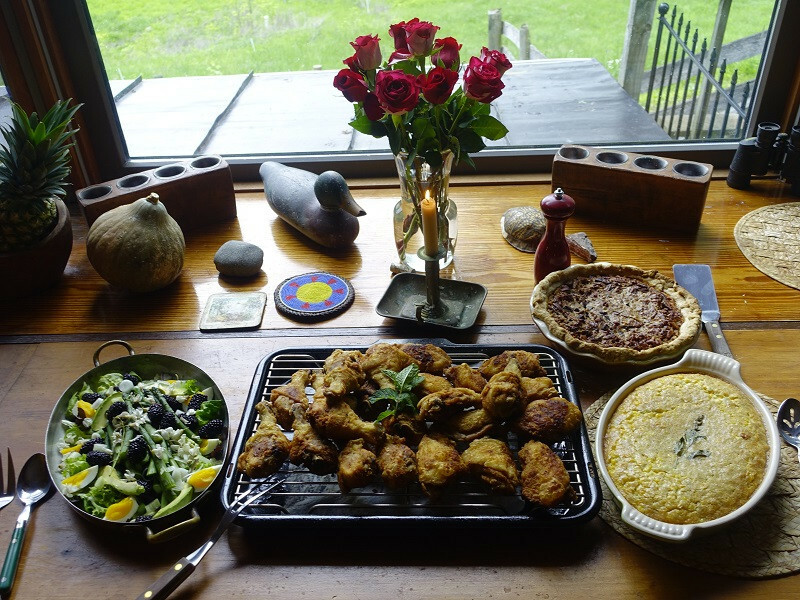 The highlight of the Kentucky Derby for her is singing My Old Kentucky Home, with the race itself placing second, and the ensuing meal for "show". 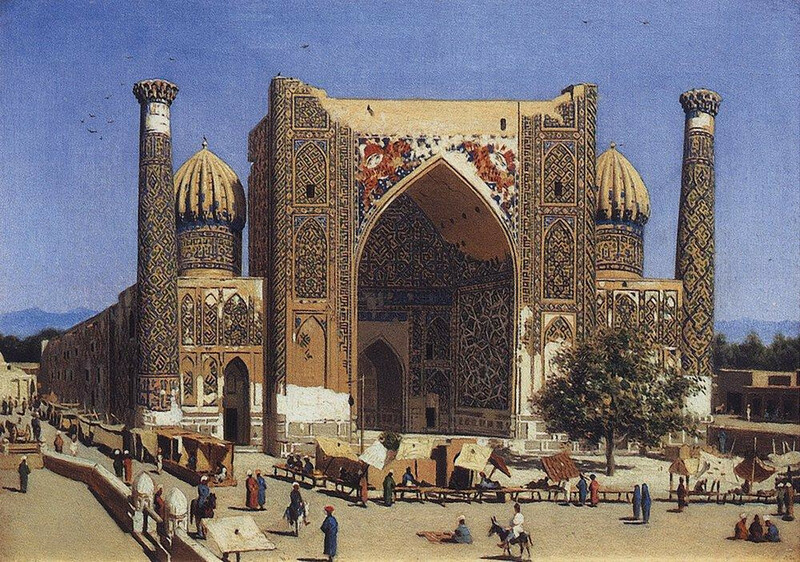 MARKETPLACE: MARKETPLACES STEM FROM ANCIENT TRADITION. With the advent of agriculture in the Middle East around 10,000 BC, surplus commodities enabled producers to begin bartering for goods to improve quality of life. Marketplaces began to be formed to facilitate such transaction, and amazingly they continue to this day, throughout the world, in nearly identical form. Vendors arrive at dawn with surplus goods in hand, set up shop with tent and table, and spend the day exchanging currencies, hopefully for the better by dusk. COLOR OF HOPE: THE COLOR OF HOPE SURFACES IN ALL NEW LIFE, BUT PARTICULARLY IN THE DOGWOOD TREE. Intense white can represent hopes of spring. 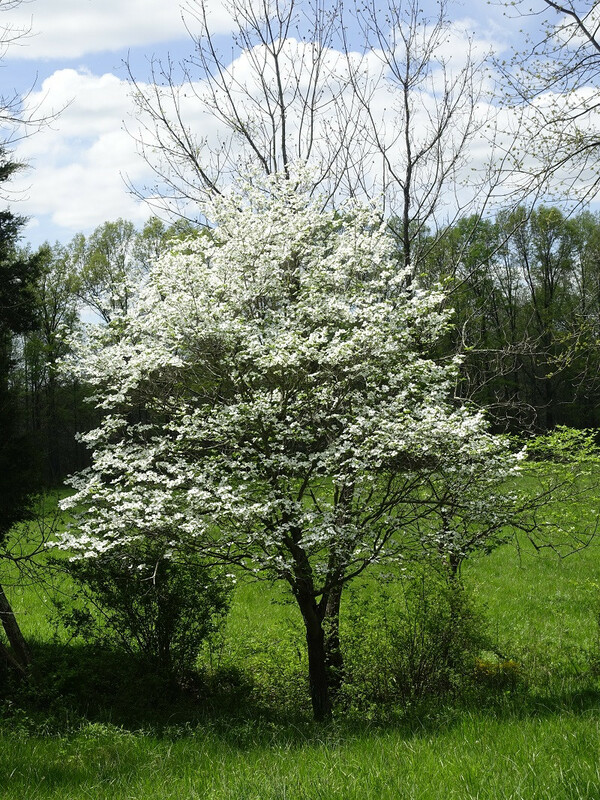 The Dogwood is uplifting and peaceful, quieting the great potency inherent in this time of year. It serves as a mediator of sorts, offering solace through pristine boughs that calm disruptive currents. 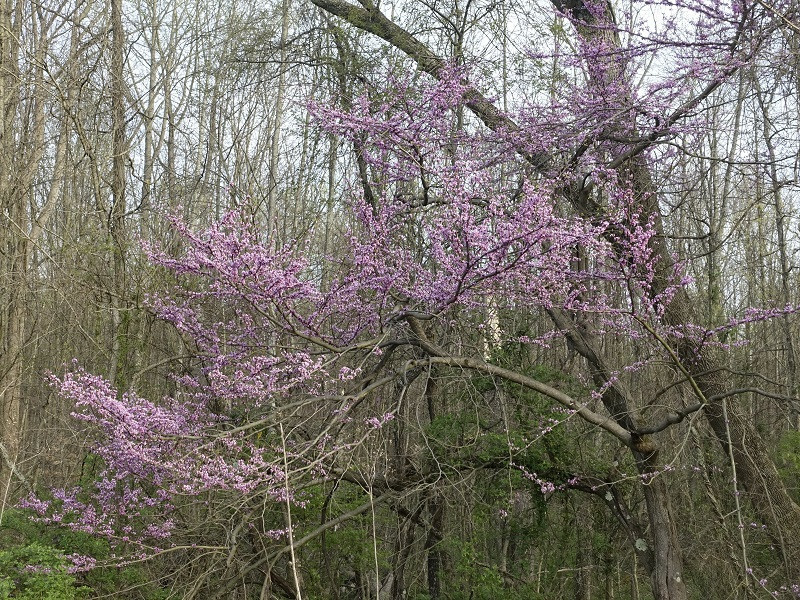 WALK IN THE WOODS: THE ONSET OF REDBUDS IS A HARBINGER OF RICHES TO BE REVEALED IN THE WOODS IN THE YEAR AHEAD. Nature is obviously coming awake, as grasses are growing, trees are turning green, birds are migrating, and wildflowers are emerging. Susan and I took a walk in the woods last weekend to look for wildflowers. We are typically too busy for leisurely strolls, but the weekend off provided welcome opportunity. 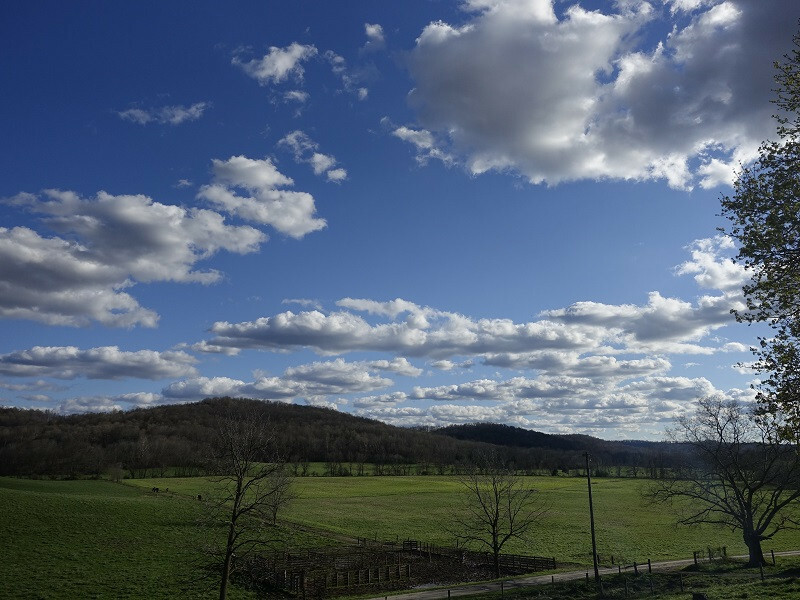 A DAY'S WORK: RESPLENDENT CLOUDS REMIND US TO PAUSE AND WITNESS. As is too often the case in the rush of a day's work, we do not see the obvious. These clouds were a magical spectacle, performed in the great hidden space above, last weekend, lasting only minutes. Fortunately, we were uncharacteristically quiet enough to witness the magic. What a fabulous few moments those clouds offered, as they passed by, so rich with presence, color, majesty, and intention. They were nature's marching band, strutting down the boulevard of the great blue beyond. We felt lucky to have looked up in time. 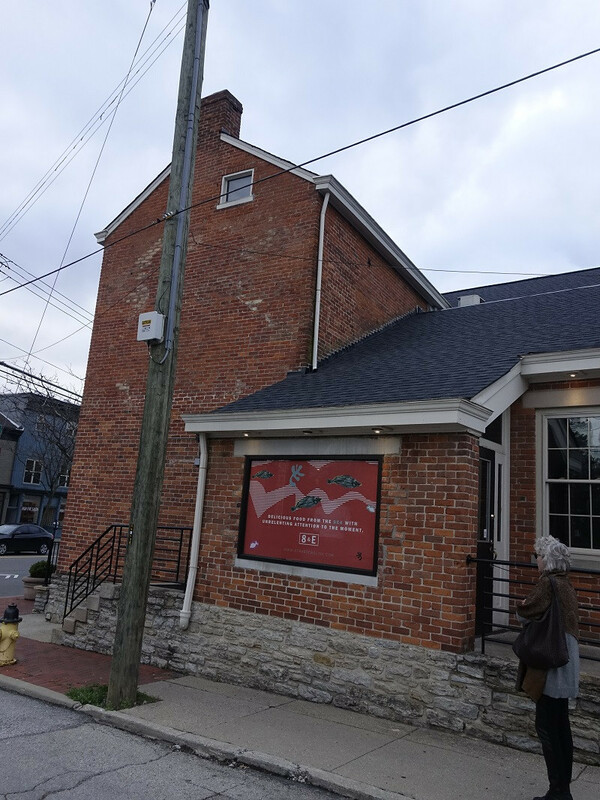 8TH & ENGLISH: CINCINNATI'S NEWEST AND BEST RESTAURANT IS 8TH & ENGLISH. Last Saturday night, we enjoyed the opening weekend of this new restaurant in O'Bryonville. 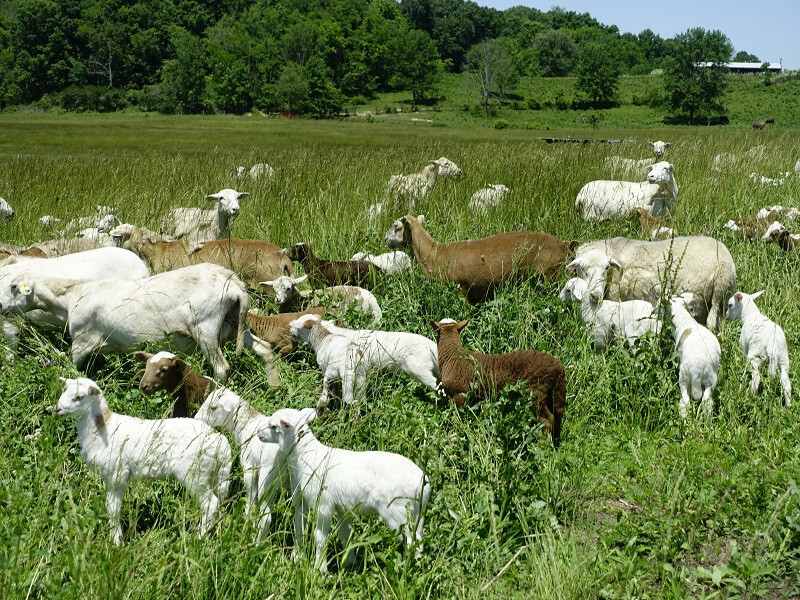 It primarily features fish, but also several dishes of our grassfed lamb (creating further connection between Hyde Park and Pike County). The evening was an inspiring success, by our standards.